Escalator riding tips for the first timers . . . Here are the tips to make you comfortable on your first ride on Escalator . #1 : Check your garments before getting on the escalator to ensure your long sweater, dress or pants won't snag in the grate. Also check accessories like loose shoelaces, dangling scarves or anklets and other jewelry that the escalator can pull in. #2 : Face forward at all times when you ride. If you're in the middle of a fascinating conversation, for example, take a time-out until you reach the next floor so you're not too busy talking to notice it's time to step off. Also wait to look around for a neighboring store until the ride is over. #3 :Stand in the middle of the step so your toes won't hang over the edge, particularly when wearing soft-sided or open-toed shoes that the grate can snag or swallow. Try not to crowd too many people on a single step. #4 :Leave several steps between you and the party that gets on the escalator before you. If they have trouble exiting the escalator for whatever reason, you'll have time to wait before a dangerous backlog occurs. #5 :Hold the handrail with one hand and your packages or child's hand with the other. Try not to rest your purse or bags on the handrail since they could either fall off the escalator or become trapped under the mechanism. #6 :Take extra precautions when riding with children, like holding their hands, not taking them on the escalator when riding in a stroller and warning them to avoid jumping on the steps and to pay attention as you approach the end of the run so they can step off quickly. 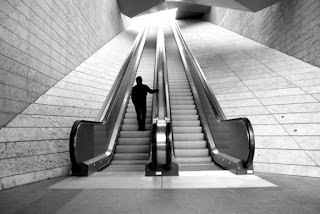 For The First Timer - Business, Startups, Health, Parenting, Lifestyle, Travel and more: Escalator riding tips for the first timers . . .